The Municipality of San Miguel in Bohol, Philippines is an interior town after the town of Trinidad and named after its patron saint, Saint Michael the Archangel. It is 86 kilometers from Tagbilaran City, Bohol’s lone city and capital; travel time takes about 1 hour and 50 minutes. 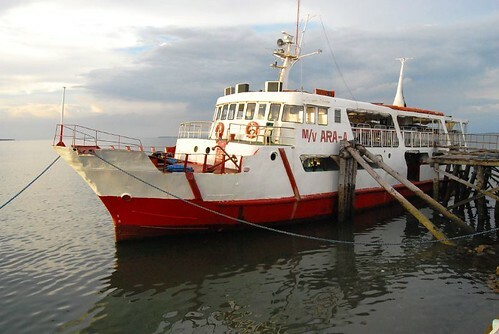 From Cebu City, San Miguel is much nearer if you choose to dock at the Talibon pier. San Miguel is only three towns away from the town of Talibon and there are many public rides such as jeepneys and buses plying the Talibon-San Miguel route. The trip will only take less than an hour or only 30 minutes of non-stop driving. 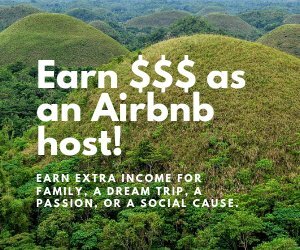 The trip to San Miguel from Tagbilaran while taking the interior route though is more scenic passing by stone churches, the famed chocolate hills and miles and miles of verdant rice fields. The national highway traversing the interior route is completely cemented and very wide. In fact, also the circumferential road along the coast of Bohol is fully cemented. 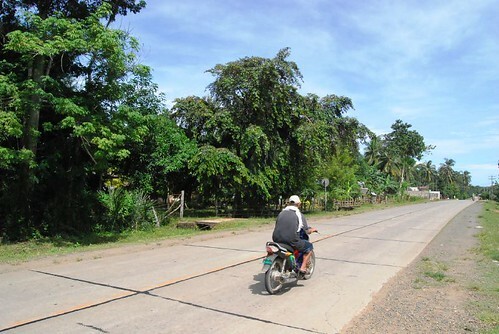 The side roads though in San Miguel, aside from those in the Poblacion, are still dirt roads but well maintained so there is ease in the transportation of goods from the farms to the town market and beyond. 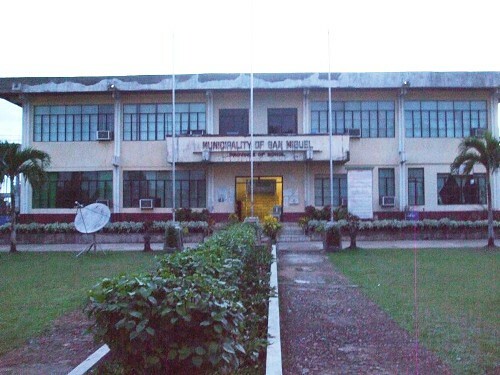 San Miguel has a municipal hall. This and the town market lies along the highway. Market day is Tuesday. People gather at the town market and engage in the buy and sell business of farm goods and other commodities. Other days are becoming busy days though, a sign of the town’s progress. The inhabitants of San Miguel are mostly of the Roman Catholic denomination. They are very religious and faithfully celebrate their feast day on May 8 with much fanfare. Religious as well as non-religious activities are lined up for a weeklong festivity including processions, search for Ms. San Miguel, tournaments and the like. 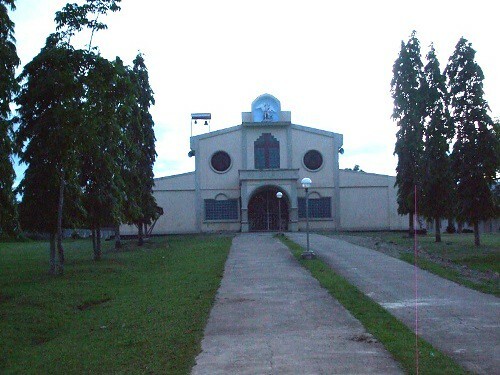 The church is situated a bit inland, back of the municipal hall, with a wide front plaza graced by tall Indian trees lining the cemented pathway leading to the church’s entrance. Simple and plain, the façade bears a big crucifix in stained glass and at the top, the image of Saint Michael. The municipality covers an area of 9,156 hectares and politically subdivided into 18 barangays, to wit: Bayongan, Bugang, Cabangahan, Caluasan, Camanaga, Cambangay Norte, Capayas, Corazon, Garcia, Hagbuyo, Kagawasan, Mahayag, Poblacion, San Isidro, San Jose, Santo Niño, San Vicente and Tomoc. The people of San Miguel are into farming, livestock raising, hat and mat weaving. The principal products are rice, corn, camote, cassava, coconuts, chickens, eggs, hats and mats made from the leaves of the “Romblon” plant. It is a quiet town composed of 3,738 households, the majority of which lies under the poverty line. To uplift the living standards of the farmers by ensuring an ample supply of water to ricelands and thus enhance the town’s economic growth, a dam was constructed. The dam is called the Bayongan Dam. 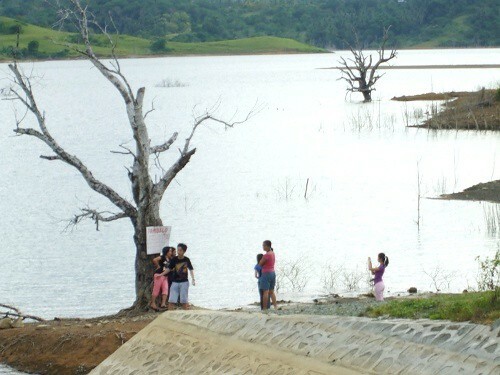 The dam will likewise feed the rice lands of the neighboring towns of Ubay and Trinidad. Also with the presence of the dam, the people were encouraged to venture into fish farming to further augment their incomes. Tilapia fingerlings were distributed to the farmers by the Bureau of Fisheries and Aquatic Resources (BFAR) as livelihood support.